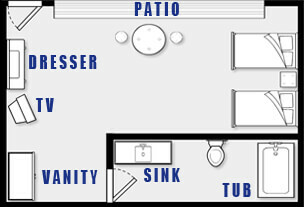 Our cozy Double Queen Room type features 2 Queen beds, Mini Fridge, Microwave, and sliding glass patio doors facing pool. Max occupancy 6 people. Available on 1st or 2nd floor.